The BBC Box that commenced global voyage in September 2008 completed the mission and returned to Southampton, UK from Thailand on October 22. The project was launched to give details of the global trade and economy through television, radio and online audiences as experienced by the BBC Box , 40 feet/Dry with code number – NYKU8210506. Interestingly, the BBC Box is also a witness to the global recession. 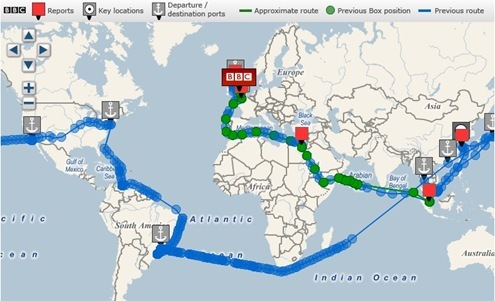 Click the map below provided by BBC News, to trace the global voyage of the BBC Box in detail. To know the lessons learned from the BBC Box, log on to BBC News.